The Dashain festival symbolizes the victory of good over evil. 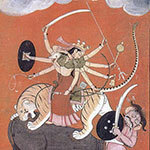 For the followers of Shaktism (one of the denominations of Hinduism) it represents the victory of the goddess Durga over the demon Mahishasura. The rest of the Hindus associate the festival with the victory of Rama over Ravana. For Nepalese Buddhists, Dashain symbolizes adoption of Buddhism by the Indian emperor Ashoka. Dashain starts on the bright lunar fortnight of the month of Ashvin and lasts for fifteen days, ending on the full moon. It usually falls on September and/or October in the Gregorian calendar. The 1st, 7th, 8th, 9th, and 10th days of the festival are considered the most important. Dashain is marked with religious ceremonies, prayers, and animal sacrifices. There also are secular traditions aimed at strengthening family and community ties. During the festival, children fly colorful kites and play on traditional bamboo swings. Many adults spend their time playing cards, although kite flying is popular among adults, too. A lot of fairs and other celebratory events and activities are held throughout the festival.